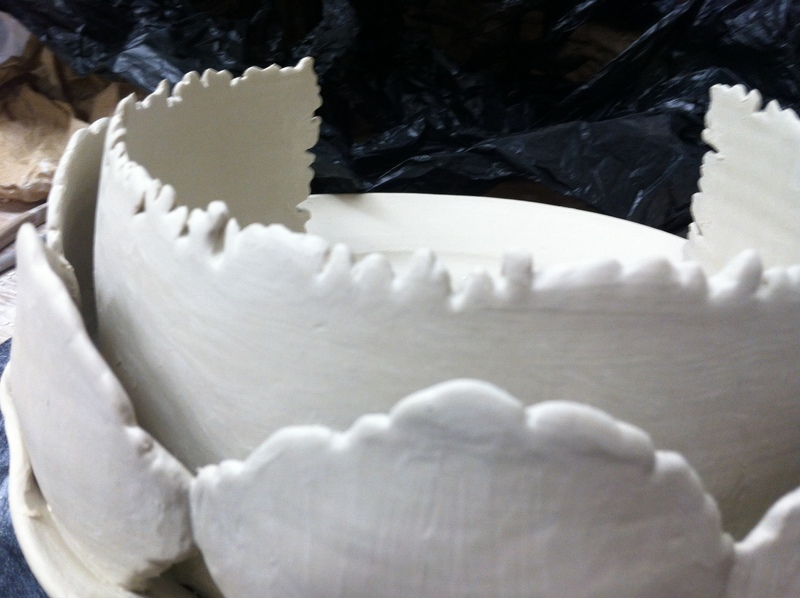 One of the tasks that I set for myself this semester was to make functional ware that is conceptually charged. 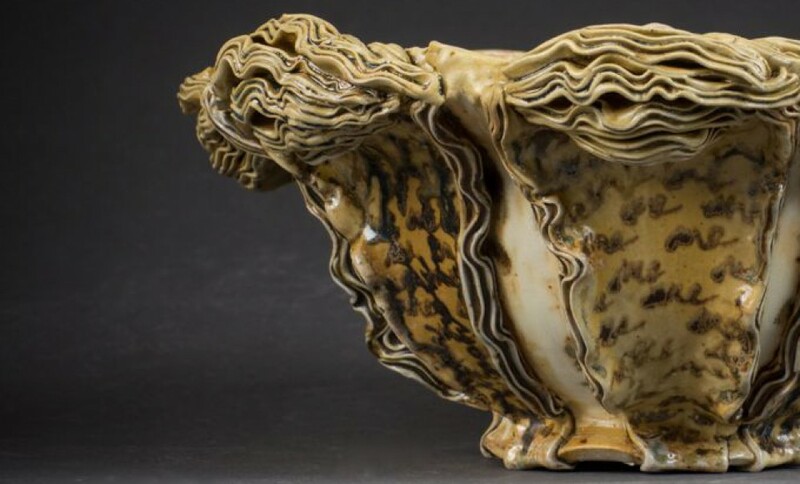 We potters often attach somewhat romantic fantasies to our motives, wherein we envision our pots going on to fulfill roles that embody generosity, celebration, intimacy, nourishment, and so on, as though the pots will live lives of never-ending joyous feasts shared amongst neighbors or loved ones or even strangers. How often do our lives resemble these joyous feasts? I made a list of cliches often found in potters’ artist’s statements (including mine) and thought about how I could make dishes that deliberately counter these often-used themes. One of those themes is the concept of sharing. So I made plates for people who don’t want to share their food. I thought about ways of dividing/protecting property and became interested in the imagery of garden hedges. These picture show my first attempts to make plates with hedges that protect food from “poachers”. I approached it as though I were building theatrical sets of scenery, using two dimensional silhouettes and layering them. Now that I see them almost completed, I realize that, while I thought I was creating work that was entirely new to me, I can still identify some elements that appear constantly in my imagery, namely sinuous linearity and layers. 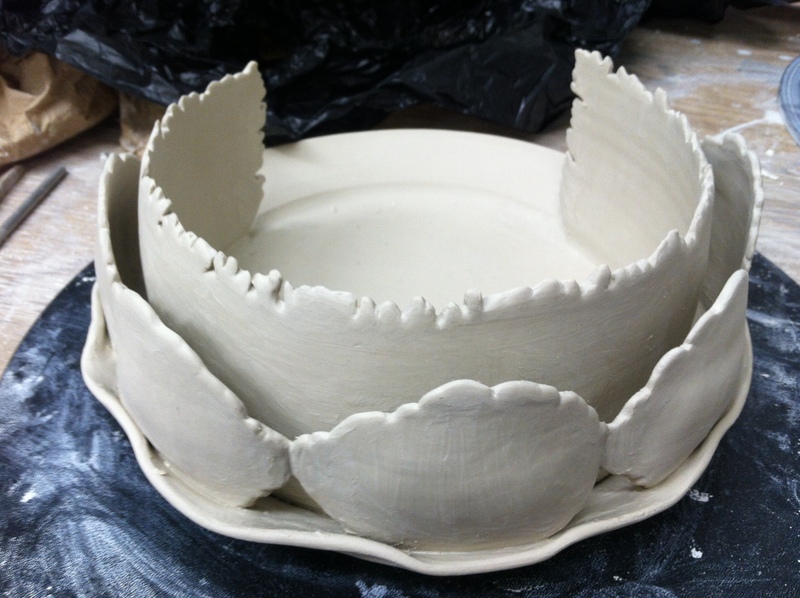 This entry was posted in studio research and tagged ceramics, hedge, plates, sharing food by saramourton. Bookmark the permalink. I would really like to see images of the finished work here.